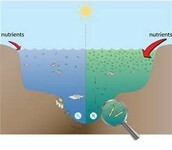 Dead zones (hypoxia) means a reduced level of oxygen in the water. It has very low oxygen concentration. 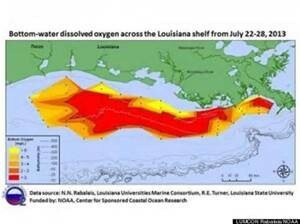 Dead zones do not contain enough oxygen levels to sustain most animal life. Hypoxia can drive fishing industries out of business, because it can reduce the number of species, and cause great losses of plants. Dead zones can cause mobile animals to virtually avoid or leave the area, leaving it deserted, abandoned, and uninhabited. The low oxygen concentration can also suffocate animals, and cause them to die. 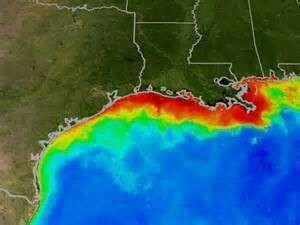 Every spring in the Gulf of Mexico, one of the worlds largest dead zones occurs. Hypoxia can affect direct-mortality of organisms. Such as fish and bottom dwelling plants and animals. Dead zones affect fish and their food base, high losses of benthic or bottom-dwelling plants and animals, reductions in numbers of species, and disruption of fish spawning, recruitment, and migration. It could. 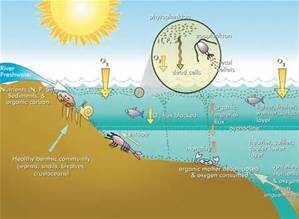 If agriculture were to occur here greatly, it could definitely affect the ocean and create dead zones because of nutrient pollution. 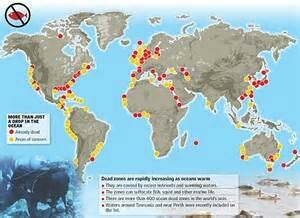 Dead zones greatly impact marine wildlife. Fishing industries could lose business, and people could not eat fish or ocean dwellers that they tend to eat. Agriculture is the primary reason for dead zones. People can cause nutrient pollution. The excessive supply of nitrogen causes detrimental effects into the food web, which distributes unevenly to the life cycle. Basically, it's when too many nutrients enter the body of water. It can cause the condition of oxygen to be below the level necessary to sustain animal life. People are studying correct farming procedures and practices of fertilizer and manure; creation and restoration of wetlands and riparian ecosystems; re-flooding of former wetlands; controls on nitrogen discharges from sewage treatment plants and industries; and changes in flood control measures throughout the Mississippi Basin. However, this may take decades to scientifically monitor for recovery. Perhaps you could either choose a new fertilizer or don't use it at all. You could use only a healthy, certain amount and regulate how much you use. It could be implemented now, but it's nothing really new, and it should be common sense to use fertilizer and do agriculture wisely.